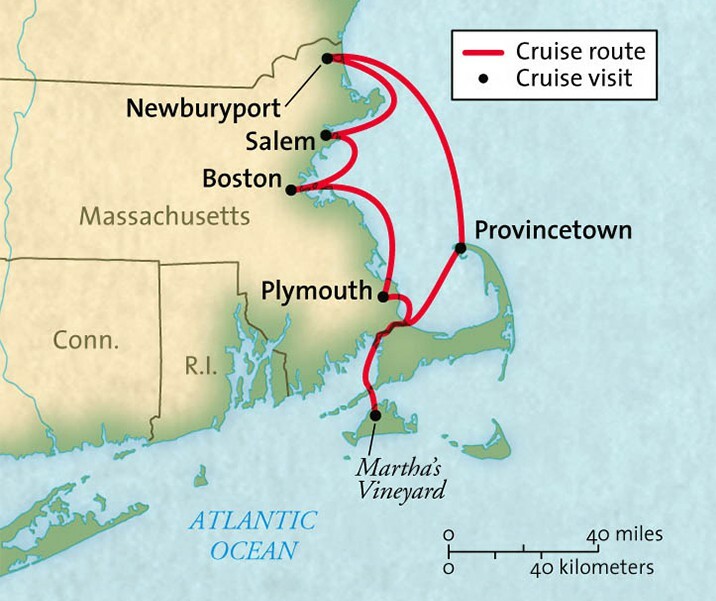 Your 8-day cruise explores the history, legends and lore of Massachusetts. Visit mystical Salem known for its 17th century witch trials. Discover Newburyport, a coastal town with a rich maritime history before relaxing on Provincetown, an island known for its large artist community. The gingerbread cottages of Martha’s Vineyard welcome you to this celebrated island where presidents and stars vacation. Back in Boston, you might choose to explore the Freedom Trail or visit one of the city’s many museums. Cabins 10 A & B: Main Deck, upper and lower berths, porthole, private facilities. Cabin 11 C: Main Deck, two lower berths, private facilities. Door to interior hallway. No window. Door to interior hallway. Cabins 20 A & B: Lower Deck, upper single berth, lower double berth, private facilities. Door to interior hallway. No window. Each cabin feature individual air conditioning, a private shower and bathrooms, and a fresh, smoke-free environment. Cabins 30 A & B: Main Deck, upper single berth, lower double berth, porthole, private facilities. Door to interior hallway. Cabins 31 A & B: Main Deck, permanent double bed, porthole, private facilities. Door to interior hallway. Each cabin feature individual air conditioning, a private shower and bathrooms, and a fresh, smoke-free environment. Cabins 40 - 41 A, 42-44 A & B: Main Deck, two single berths, fixed window, private facilities. Door to interior hallway. Cabin 40 B: Main Deck, two single berths, fixed window, private facilities. Door to interior hallway. Cabins 41 B: Main Deck, permanent double bed, fixed window, private facilities. Door to interior hallway. Cabins 60 - 62 A: Sun Deck, two single berths, sliding window, private facilities. Door to outside deck. Cabins 82 A & B: Sun Deck, permanent double bed, sliding window, private facilities. Door to outside deck. Each cabin feature individual air conditioning, a private shower and bathrooms, and a fresh, smoke-free environment. Cabins 50 - 57 A & B: Sun Deck, two lower berths, sliding window, private facilities. Door to interior hallway. Cabins may be made up as double berths (except 55 A). Cabins 70 A & B: Sun Deck, two lower berths, sliding window, private facilities. Door to outside deck. Cabins 80 B, 81 B: Sun Deck, permanent double bed, sliding window, private facilities. Door to outside deck. Each cabin feature individual air conditioning, a private shower and bathrooms, and a fresh, smoke-free environment. You’ll board today at noon in Boston, and then spend some free time exploring this historic city. Boston is the perfect start to this 8-day cruise which highlights pivotal places and points in New England’s deep-rooted history. Each port you visit presents a part of New England’s profound legacy over time. Learn about some of the most remarkable and notable stories and artifacts in Massachusetts and U.S. history. Welcome to Salem, a popular tourist destination on the north coast of Massachusetts. Most known for its witch trials in the 17th century, the area is also home to many important historical sites. The setting for Arthur Miller’s “The Crucible,” the town boasts the Salem Witch Museum, host of staged exhibits where visitors can follow the trails based on original documents of the witch-hunt. In the evening, discover the restaurants and cafes of this city’s lively downtown. Dock in Newburyport this morning and spend the day exploring the numerous historic homes and local shops in this small coastal city close to the New Hampshire border. Known for its rich maritime history and robust boater community, Newburyport is also the birthplace of the US Coast Guard. A great place for activities on and by the water, the area prides itself on a diverse offering of local artisans, restaurants and shops. Spend the first half of your day cruising to the northern tip of Cape Cod. Around noon, arrive in Provincetown, Massachusetts or “P-town,” which is known for its lively galleries, artists, and beaches. It was here in Provincetown that on November 11, 1620 the passengers aboard The Mayflower first stopped, 5 weeks before settling in Plymouth, Ma. A 252-foot Pilgrim Monument symbolizes their landing here where 41 Pilgrims signed the Mayflower Compact, while still aboard the ship in Provincetown Harbor. At night, explore P-town’s nightclubs, which include cabaret and piano bars. Arrive on the island of Martha’s Vineyard this morning, accessible only by boat or plane. Check out the charming gingerbread cottages, take a ride on the Flying Horses carousel or enjoy the harbor views while exploring the many boutique shops and restaurants. For many years, famous political figures including presidents and celebrities, have vacationed on “The Vineyard”. It was also here that the original Jaws movie was filmed in 1974. Arrive in historic Plymouth this afternoon. In 1620, English settlers, known as Pilgrims, boarded their ship, Mayflower, from Plymouth England and sailed across the Atlantic Ocean in search of religious freedom. As one the country’s first settlements, Plymouth is also known as “America’s Hometown”. Be sure to stop by the Pilgrim Hall Museum, the oldest continuously operating museum in the US. Optional sightseeing tours are at an additional cost. All itineraries including ports, activities and routes are subject to change based on availability, weather, river, water levels and sea conditions. She was refurbished in 2010, with totally new cabin configurations including new décor, new bathrooms, new furniture in the cabins, a renovated lounge, new décor, and brand new furniture. So if you want to take in a few rays on the sun deck, relax and enjoy the vista-view lounge, or just have a few quiet moments in your cabin as the sea drifts past your open picture window, the Grande Mariner is ready. Come cruise with us from New York City, past the Statue of Liberty, up the Hudson River, to the Erie Canal, Lake Ontario, north to Canada via the St. Lawrence ......click here to read more. The breathtaking Lake Michigan is a scenic journey filled with natural beauty. Its coastline is met by picturesque lighthouses on white sand beaches, charming small towns rich in history, and ......click here to read more. Natural wonders are closer than you think. This cruise will have you exploring colorful gardens, hiking in Acadia National Park and whale watching along the Bay of Fundy. This is ......click here to read more.